You’ve practiced hard and tension has a habit of mounting. 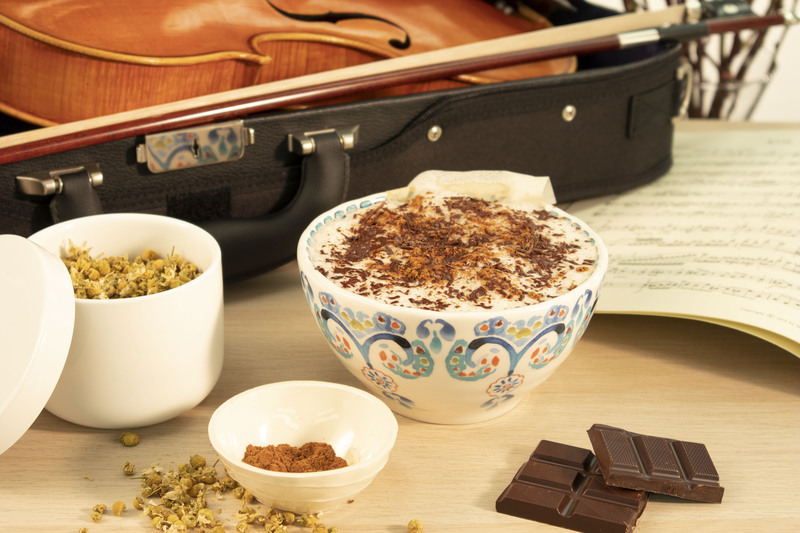 Treat yourself to this warm, frothy, chamomile latte to help you sleep the night before your performance, or enjoy it just before you begin to warm up back stage. Take the time to breathe before your big performance. Chamomile is naturally caffeine free so is great any time of day or night. The sweet vanilla soy milk is heated and frothed; with the added honey and the aromatics of the cinnamon and chocolate, this will comfort and ease any butterflies in your stomach. If you don't have a frother, you can simply whisk the soy milk on a stove top until hot and frothy. Also, while chamomile flowers are not always available, you can easily find simple chamomile tea bags in most grocery stores - two is probably good depending on your taste. Of course, you will want to double the recipe if you are sharing with your stand partner or accompanist. Add 2 tbsp of chamomile flowers to a large tea bag (or use two pre-made chamomile tea bags) and place in a large bowl. Pour 1 tbsp of honey in to the bowl with the tea bag(s). Heat and wisk the vanilla soy milk in a saucepan, or use a heating frother until it is frothy and hot but not boiling. Pour the hot soy milk and froth over the tea bag and let steep for 3-5 minutes. Sprinkle a pinch of cinnamon and chocolate over the top. Stop worrying and calm yourself while you enjoy your delicious chamomile latte. Thank you for reading and watching our third drink recipe for the spring recital and concert season! We hope you will find these drinks enjoyable, and that they might help you through this hectic time of year. If you haven't seen the first two recipes, click the link below! Also, please subscribe to be notified of future blogs like our next and final drink recipe.